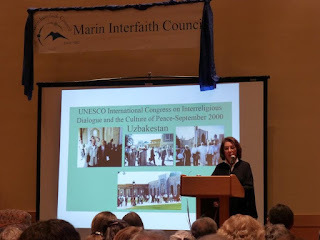 The "State of Formation" is a journalist-style blog of the Parliament of the World's Religions and Journal of Inter-Religious Dialogue, with contributors. Recently, Rebecca Levi posted about her upcoming wedding ceremony (Jewish and lesbian)... making a statement or engaging in authentic religious ritual? Check this article out, and others. It's been an adventurous year: another two semesters at the religiously diverse Graduate Theological Union, my first attendance at the biennial Women & Mythology conference, spending the summer with Mormons in Provo, Utah, communing with gay and lesbian Mormons in Seattle for a weekend in October, AAR (American Academy of Religion), speaking on issues in Paganism for a panel on LGBTQ youth and religion, and finally, a weekend with Unitarian Universalist emerging scholars. I'm saddened about the change in the Parliament of the World's Religions. Have been anxiously looking forward to it. The Council is doing what it can to plan for the future of the Parliament. While Brussels has withdrawn its bid, there is a possibility of a Parliament at a different site in the next few years. We will likely not know the outcome for several months. "Congratulations for submitting a worthy project that represents the best elements and talents of our doctoral program." 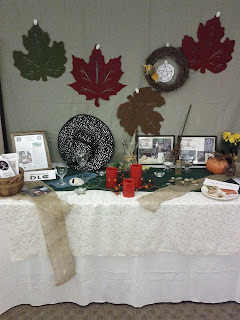 For more information, see our website: http://pagansonthehill.blogspot.com. As most of you know, I attended the North American Interfaith Network Connect this year in Atlanta Georgia. It is late because I did not wish to interrupt Don’s postings. What a wonderful experience!! As one of only two, anything like Witches, at this event, I usually feel a bit left out and spend most of my time explaining why one issue or another does not apply. This year was a completely different experience. I came determined to discuss the questions that everyone seems reluctant to discuss and discovered that everyone wanted to discuss them. The younger people especially were really looking for some depth to conversation. As an example they were by far and away in agreement that their favorite panel, on LGBT(et al) where there was actually some drama when, after two young people shared their feelings of isolation because of church policies, a person stood up and read a verse from the Koran condemning alternative sexual orientations. Unfortunately he approached this in a very insensitive manner and…well you can imagine the conversation from there, as I must who did not get to the panel despite my best efforts. I was pleased to discover later that they agreed that they liked my presentation second best. I had the opportunity at one point to accuse them of ageism when I found them all sitting at one table, and they asked if I wanted to volunteer as their token “elder”. My favorite part of the weekend was when the moderator of our panel introduced us as women of a certain age who were no longer afraid to say what they felt needed to be said. (Not a snicker here). I had started out as a panel presentation on “The hard questions” and the planners asked if I would combine my talk with another. I know all these ladies and was pleased to do so. They said that we could have 20minutes each originally but when we got to the presentation we discovered that they had allowed us 10 minutes. I curtailed my talk and the moderator, my friend Bettina Grey, did her best to keep the others down in time, but most had written out their talks and it was difficult. This presentation will be available in the evening after council this year. There was a huge part of this Connect that was based around social justice and Martin Luther King figured large in the tours that we took along with Jimmy Carter. I was able to meet some personal heros of my own, who had marched with and helped plan with King. Dr Rev. Vivian who is now in his late 80’s is one of those men. It was a seminal moment for me. There is so much more to report but our sight (http://nain.org/nainconnect12report.htm) NAIN.org has done a much better job so I direct you there for pictorial proof of my attendance along with a complete report on the event. Greg and I woke in our hotel in Panajachel for our last full day in Guatemala. 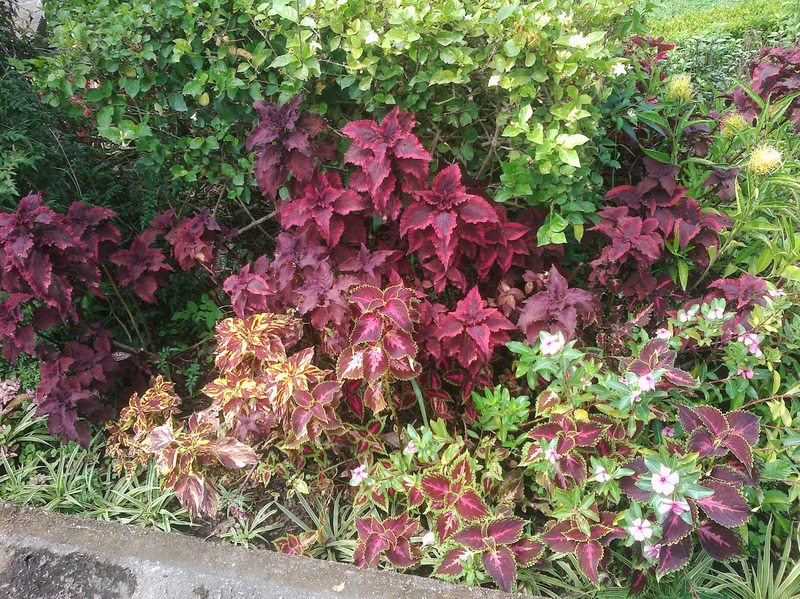 After breakfast, we walked around part of Lake Atitlan, marveling at the variety of flowering plants. Sooner than we would have liked, we packed our bags and boarded a hotel shuttle for the three and a half hour ride back to Guatemala City. Three and a half hours seemed short, given the lengths of the trips that got us here; five and a half hours seemed more reasonable. 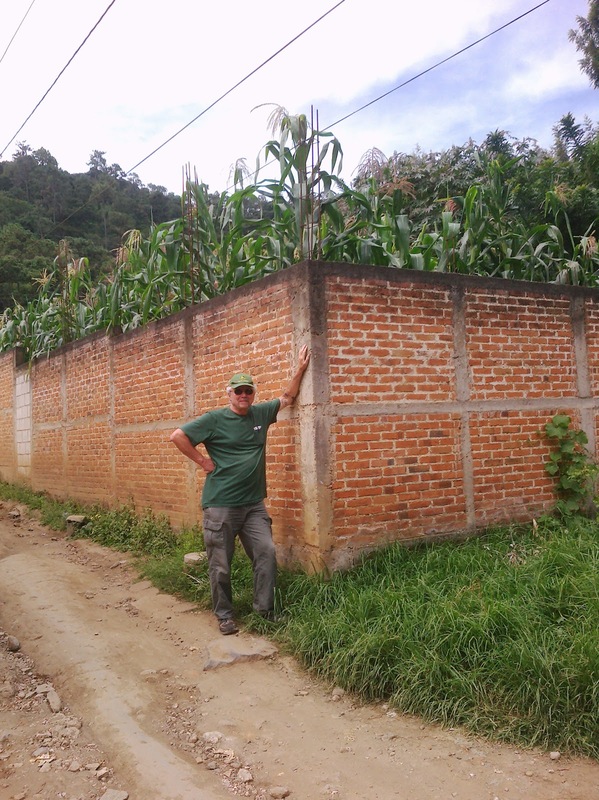 The reason for the difference was that our driver, Alfonso, averaged 100 mph for the whole drive! Even when we once again encountered blinding rain on the pass over the mountains, he only slowed to what we would consider a reckless speed. The drive, between bouts of car-sickness, gave us time to reflect on the trip. It obviously did not go as expected. Our brief time with Tata confirmed the bonds of friendship and fellowship he feels between him and me and between the Maya and the Wicca. There is definitely a relationship to be nurtured here. (We have been talking about hosting another meeting of Elders later in the year, but that is still in the planning stages.) As it turned out, we spent almost all of our time with Wilma. 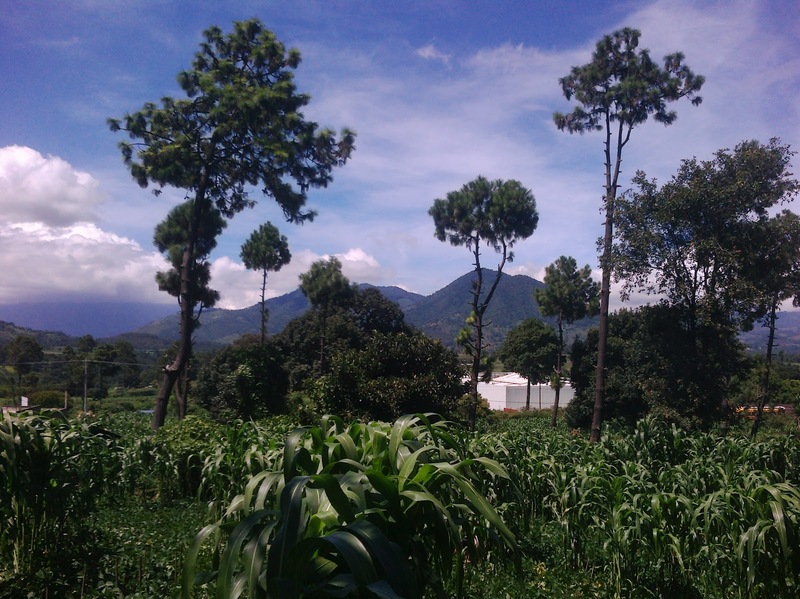 She, too, is a practitioner of the old Maya ways – one of considerable knowledge & skill. We always talk about the balance of male & female energies (and, or course, everything in between) in the spiritual paths of the people of the Earth, so it was fitting that we experience Wilma’s way of working, having experienced Tata’s. We formed a strong bond of love and respect with her. She shared secrets of the old ways with us. We look forward to working with both her and Tata in the future. 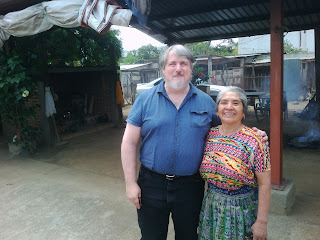 I came to meet with a Maya leader and was blessed to end up meeting with two! We arrived in Guatemala City around 4pm and found our hotel near the airport. Here we have had a chance to relax, get our bags packed, and prepare for the 13 hour flight home (with a layover in Atlanta). We may have time to go to the Archeological Museum or the Popol Vuh Museum before we leave, but probably not. We have one final task we must perform before we leave Guatemala. 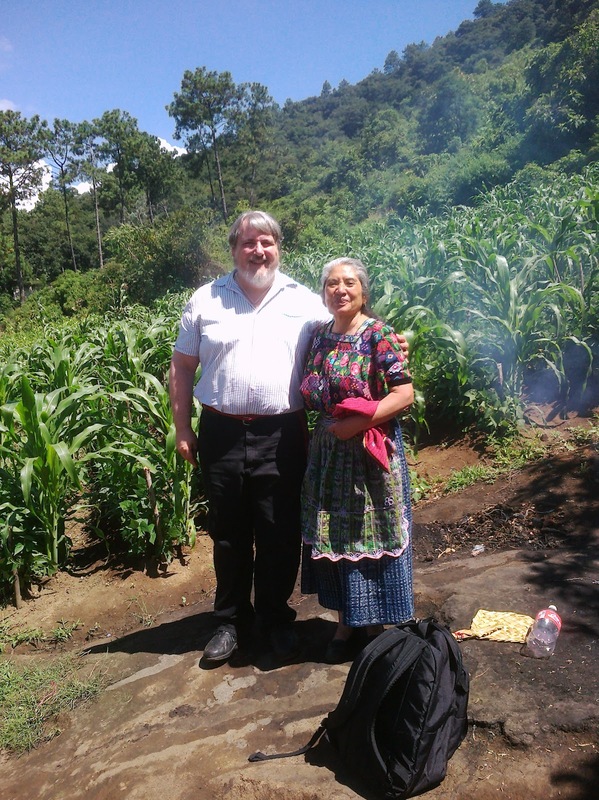 Yoland Trevino, emeritus Chair of the Global Council of the United Religions Initiative, is an indigenous Mayan and was born in Guatemala. Her sister lives near our hotel and will be dropping off family papers for us to deliver to her. I would like to thank my very good friend Greg Stafford, who dropped everything to come with me at the last minute, help with translation, provide spiritual support in & out of ceremony, and generally watched my back as I traveled in a country where I didn’t really know the language or culture. We woke to another beautiful day. Greg was glad that his over-the-top Pepto Bismol counter-attack had succeeded in defeating la venga. He downplayed the triumph saying “Of course, now I probably won’t s**t for a week.” We ate breakfast and met Vilma, who arrived in a cab driven by a friend – Don Patriceño. She told us that Tata was recovering, but was at home under the care of Kukumatz. Don Patriceño drove us all up the road, then onto a dirt road, from which point we had to walk to the sacred site up a path. The site was in the middle of a large milpa, or corn field with rows of beans in-between, on the slopes of a large hill. It was a bit of a steep walk up to it and I carried a bag of ritual ingredients bigger than a golf bag that easily weighed over 50 lbs. It was serious & strenuous work, but I viewed it as part of the sacrificial preparation for the rite. The site had three altars of simple stone – two for positive magic and one for “binding” type work. 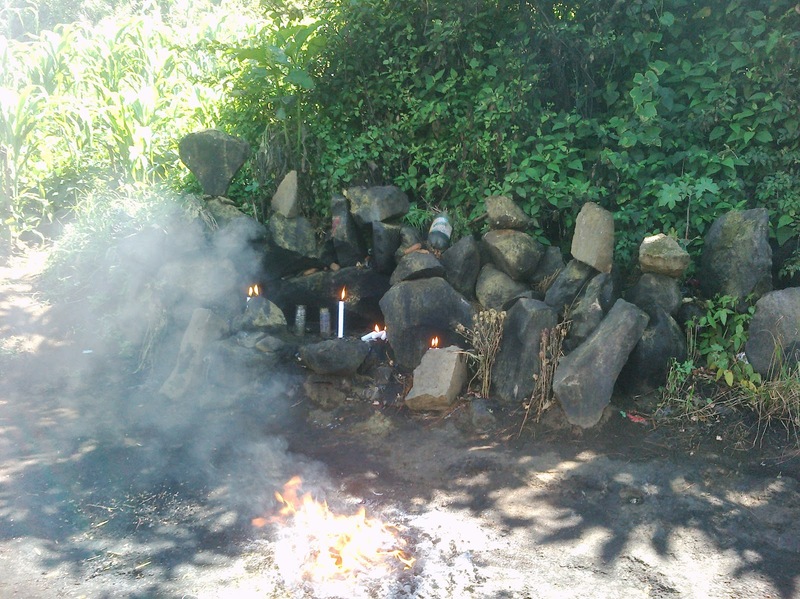 The site is cared for by a Guardian, the land owner, who keeps out anyone who shouldn’t be there, watches over candles or fires left burning, cleans up after the rituals, etc. He appeared when we arrived, recognized Wilma, and then disappeared until the ceremony was over. 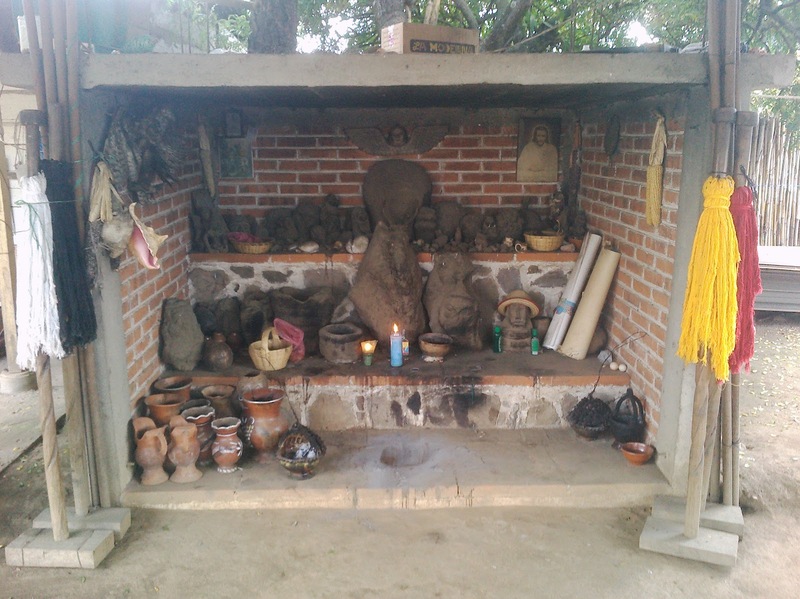 When I finally set down Wilma’s bundle, it was like a “Bag of Holding.” She proceeded to draw a seemingly endless variety of incenses, velas, and ritual items from within. We talked about how the Elements are viewed in our three traditions. Wilma pointed to the fire and said that it was the home of “los salamandres”, indicating influence from the Western magickal tradition. Wilma set four candles burning on the main (positive) altar, while I did two more and Greg two more as well. She prepared a fire similar to yesterday’s that consisted of several types of incense, and over in front of the second (positive) altar, a second fire for healing, again as yesterday. She explained to us again the meaning of the day, which was 7 Ajpu, and bears the powers of the deer hunter, the sun, and the hero. It represents “triumph over problems and difficulties”, which seemed auspicious. Also, the numbers 7, 8, and 9 represent balance and “measured strength”, also auspicious for the task at hand (if you’ll pardon the pun). For me, the healing part of the ceremony was very personal, so I’m not going to say a lot. It began with Wilma leading me over to the second fire. She did the cleaning passes again, but this time, in addition to limes and eggs, she held small cans of I-don’t-know-what. She tossed ALL of these into the fire. The timing of the cans exploding later was deemed significant. After the cleansing, we returned to the main fire to make offerings and pray for healing. I was told not to look at the smaller fire until it had burned out, even when cans exploded like cannon-shells. She led us all in making offerings of various substances for her giant bag – many different kinds of incenses, but also hundreds of velas of different colors. The first (and loudest) can exploded as I was making a particular offering, which Wilma said indicated the favor of the Spirits. 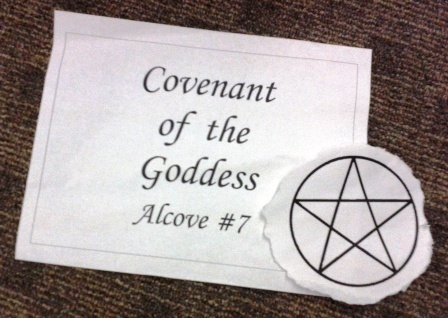 More positive omens came during the end of the rite. An orange butterfly entered the space and flew to the candle altar. It then circled the main fire sunwise and dashed away. Wilma reminded us that butterflies are often Spirits of the Dead and I wondered if this was Gary Smith. We made offerings for the Dead, followed by offerings for the living. When I made an offering for Rachael Watcher, the flames suddenly twisted around like a spiral, like a little cyclone about two feet tall. Wilma noted this and her earlier comment about the “salamanders” then seemed especially significant. It felt good to have Wilma do the ceremony as she brought a healing, feminine energy to it. As we wrapped up, the Guardian appeared to see if we were done and he should clean the site. Wilma said that this would be the last work for this trip. What we had done here would continue to progress. She & Tata wanted us to have enough time left see something more of Guatemala than the truck stop hotel. 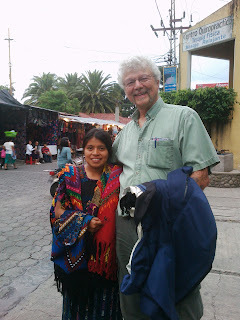 We asked her about Panachel, a former Maya village and now a tourist center on Lake Atitlan. Wilma told us the lake was no longer “the most beautiful lake in the world,” as the guidebook said. We decided we needed to see it before it got worse. So we went back to the hotel, quickly packed our bags, checked out, and took Don Patriceño’s taxi to beautiful Panajachel. On the way, we stopped at Tata’s house to drop off some photos and say one last goodbye. Going over the crest of the mountains between Panajachel and Chimaltenango we went through one of the hardest rains I’d ever seen. Don Patriceño slowed the taxi to a crawl for much of the mountain pass. 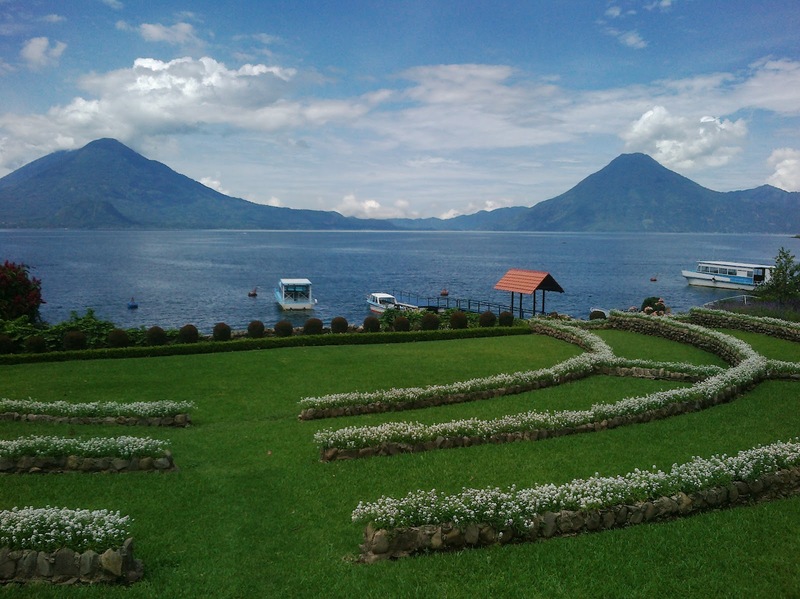 We finally reached Panajachel to find that is still very much one of the most beautiful lakes in the world! 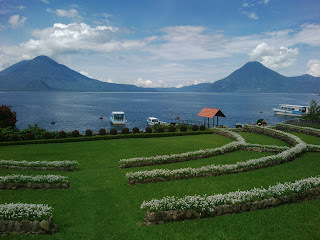 The lake is surrounded by three volcanoes. We took a hotel outside Panajachel with a few more amenities that an electric showerhead, and took hot showers that reminded us of how fortunate we are in our daily lives to have such luxuries in our own houses. We headed into Panachel in another tuk tuk. Greg had discovered the address of the only book store in town, where we got out. A couple of women vending on the sidewalk urged us to buy their wares, but with books ahead of us we had no interest. It was a cute little shop, with every book sealed closed, to be opened with the permission of the proprietress. Probably 80% were Spanish, and many of those within our field of interest were American in origin, and hence more expensive than buying them new at home. We both bought some that we though unlikely to be found at home, and then ventured back into the street, passing the women who once again urged us to purchase their weavings, without success. The street of shops and vendors was pretty typical of such a place anywhere. Many small shops all sold essentially the same things, none of which interested us. As we came back up the street vendors came at us in force after Greg purchased some cheap woven friendship bracelets from a young boy who told us he needed money for his school and to feed his seven brothers and five sisters. It was just the first huckstering story we got, but not the last. Once they saw money pass hands, the women with more expensive materials got much more aggressive. Neither of us could just brush them off, even when they bore nothing of interest. One woman had a pretty blue manta that attracted Greg’s interest enough to haggle over the price. That incited the rest of the women to a frenzy of entreaties, close to begging in some cases. After I, too, bought a manta, one of the women from in front of the book store, who had been dogging along with the crowd, got angry. “I saw you first,” she cried, and didn’t stop as we strolled away. A young girl approached and when Greg called her senora she laughed and corrected him. Her laughter, contrasting with the other older women, was almost magnetic, her eyes were lovely, and since her wares were also quite nice he decided to purchase one. This only brought the rest in closer towards their prey (us). The angry woman who had seen us first started badgering me and I was polite in my refusal, but at last she said, “You are a bad man,” and stamped away. Meanwhile Greg had purchased a second piece from the girl with the lovely eyes, who was named Thomasa. Greg told her, “When you go to church you remember to say, ‘Thank you, God for my magic eyes’,” which was just more reason for her to laugh. Her wares were quite nice, and I even bought one. Greg said, “This has probably made her whole month. (turning to her) Que dice, senorita?” “Gracias Dios por mis ojos magicos,” she laughed, and we all went on our way content and happy... Except for the first woman who seemed to be muttering curses at me as she watched all this from a distance and will probably hate la senorita forever now. In one shop, I saw a perfect gift for Anna. (Since she’ll probably read this before I get home, I won’t say what it was.) The proprietress was a tiny woman, the top of whose head came up to Greg’s arm pit. We got into a serious haggle over this item, with Greg translating. Her comments included “This is hand done by me,” and “You’ll never see something this beautiful,” and “I have to feed my family” and “Look at this work! No factory work here!” and especially “Oh, I need medicine for my poor old leg, look at it,” which she accentuated with a sudden limp and expressions of great trouble and agony, all of which disappeared the next moment as she joyfully claimed “Look at these tiny stitches with my old hands.” It went on for five or more minutes, nonstop. In the end, we reached an agreement that left us both very happy. We retired to the hotel for a very fine dinner, watching the lightning over the volcanoes again. Greg retired, I sat down to try to write this, and fell asleep at the keyboard (as I mentioned above). The ceiling of our room kept flashing light and dark from the lightning across the lake. In this way, we were lulled into sleep… and dreams. We were up early to prepare for the ceremony. A shower and change into clean clothes seemed appropriate. After a quick breakfast of cornflakes in mosh, Kukumatz picked us up at 7am. 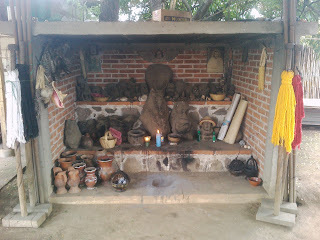 We drove to a place owned by a friend of theirs, a Maya who maintained a sacred space for ceremonies. At the site Wilma said that Tata had finally agreed to see a doctor, so she would be doing the ceremony today. I’ll describe what I can, but some things that happened and were said are Maya secrets and I can’t discuss them, while others are personal and I won’t discuss them. Wilma said that today is 6 Kawoq – a day of lightning, thunder, rain (all of which we had plenty of yesterday &, judging from the sky right now, soon); for the Ancestors; to accomplish work for humanity, to resolve problems and remove obstacles; a day for those who intercede for health or to end problems. We told her that today is Lughnasad and what that means in the Wiccan tradition. The ritual space was rectangular, about 40 by 15 feet. At the East end was an enclosed altar, open on the side towards the ritual space, about 6 feet deep and 5 and a half feet high. This was filled with stone figures and offering containers, pictures on the wall of Jesus and St. George, and a stuffed owl with its wings spread on the North wall, and other things. The sculptures resembled those from Tata’s altar room; in fact the central “figure” was a large rough stone with no discernable carvings. Towards the West of the space, was a small unlit fire laid on the earth. This was specifically for my healing work. In the center ritual space was a larger fire circle. Before we arrived, the circle had been marked with what appeared to be pine needles and, within that, a circle of white corn meal. That circle it was quartered more corn meal, with over that, a symbol. To the southeast was a table about the size of a ping-pong table heaped with bags and piles of items and offerings, some for the construction of the fire and the rest to be offered to the fire once it was going. As we watched Wilma took the first of these: some sort of incense, shaped like little, squat volcanoes, and packed in stacks inside wrapped palm (?) leaves. These she laid over the design that had been marked. In the very center, she placed a tied bundle of about 40 upright handmade cigars with long-wicked candles mixed in with them. A similar bundle was placed before the altar. This was followed by layer upon layer of myrrh, blocks of chocolate, sweetgrass, palo santo, cacao beans, something we didn’t quite catch that represented “money”, frankincense, various unknown incenses pressed into unusual shapes, seeds, etc. Greg and I had both stopped trying to count by this time to be present in the ceremony. The layers included hundreds of small candles (velas) – some in colors for the directions (East / Red, South / Yellow, West / Black, North / White) and some representing Sky (Blue) and the Natural World (Green). Once the fire was ready to be lit, Wilma donned a ceremonial head-scarf and invited me to don my cord. I then sat to the North of the central fire, with Greg to my right, in the west. 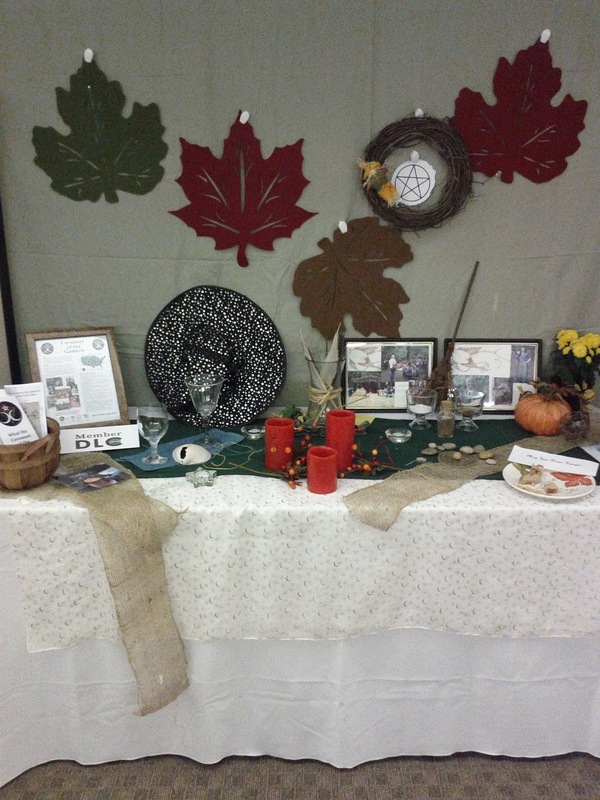 Wilma gave each of us a cloth filled with velas and offerings – both from her table and ones that we had brought (sage, tobacco, nuts, and fruit) – to hold until the time was right. She then moved between the fire and the table of offerings. With a handful of burning velas Wilma then lit all three fires. She lit the central one and those at the altar by lighting the cigars first. As she did this, she invoked / prayed in K’iche’ Mayan. She kept adding offerings to the fire and the fire kept getting hotter and hotter. Greg and I moved further and further back, fearing that our personal candles would melt (or our pants catch fire). Wilma invoked the Ancestors – the Grandfathers & Grandmothers – those of the Maya, of this place, and of her visitors, Greg and me. The string around the bundle of cigars burned through and the cigars fell over to the North & South, indicating to Wilma that the connection between North & South had been made and that our Spirits working together. Wilma then instructed Greg and I to each make our own offerings to the Ancestors. (I understood it to be to my Ancestors and to those of the Maya. Greg understood it to be to his ancestors and to those we had in common with the Maya.) This was to be a time of offering, not of requesting, which would come later. We offered from our hearts, with humility, respect, and tears in our eyes. When Wilma made her own offering the Spirits told her to sing. She told us that the offerings had been accepted. Wilma then took me to the smaller, healing circle, which included purple candles. She told Greg not to watch the healing. Instead he should be sure that our empty offering bags on the ground by the fire did not burn. She did a cleansing, holding both an egg and a lime in each hand as she made passes over my body, placing these in the fire after each pass. She paid special attention to my left hand, arm, and the sight of my injury near the spine. Soon the fire was full of eggs and limes. 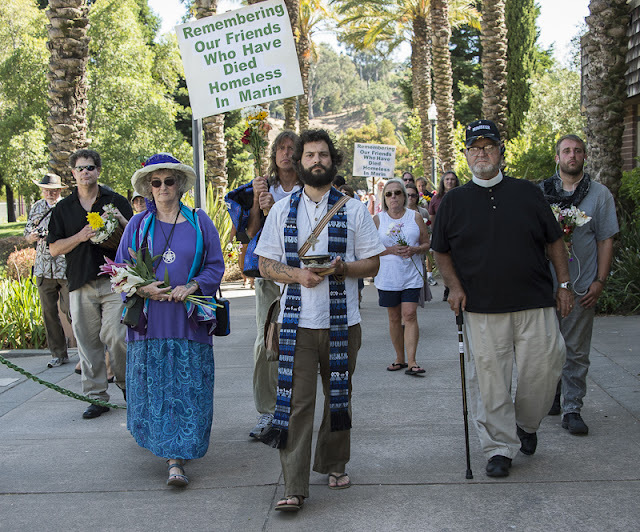 Wilma explained that this had been an “introduction” – a chance for me & Greg & our Spirits to meet theirs – and that the real healing work was to come. While drinking, I told Wilma about having met Tata for the first time in Pittsburgh at the URI Charter Signing. With a start, she said that she had been there too and that we must have met, as Tata had told her that he thought she and I had met. He was right. In fact, I had purchased a softball-sized chunk of copal from her that day, 12 years ago. We also shared memories of Gary Smith, the Lakota representative who had been instrumental in introducing me & Rowan Fairgrove to various indigenous people before his death in 2003. 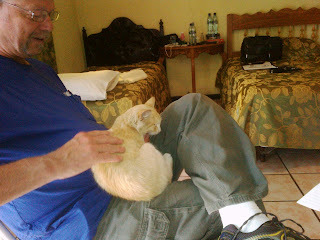 [Tom, the scrawny hotel cat, just wandered into our room and after a little coaxing is curled up purring in Greg’s lap while I type. I think I have just taken more pictures of the cat than of everything else on this trip combined. We are obviously both in serious cat-withdrawal.] Wilma noted that the fire was not yet out and that we should offer thanks for Gary, the work he did, and the way he was responsible for bringing us together. Once everything was done we asked if we could take a few photos of the altar and of each other with her. Greg asked to make sure it was okay to share the information about the ceremony with others. She agreed, as long as the photos and info would be shared with people who would treat them respectfully. All together the ceremony had been about three hours long. She said that, if all was well, we would go to Tata’s special place tomorrow. Wilma & Kukumatz drove us back to the hotel. She got out of the car to hug us “Hasta Mañana” and to say that we should be sure to “pay attention to your sleep.” The import of this didn’t register with us until we sat in our room and talked briefly, then woke! We had both dozed off almost immediately and both had dreamed dreams with surprising similarities. We will tell Wilma about our dreams tomorrow, and hopefully with Tata. After our naps, we had a bite to eat in the hotel, studying the K’iche’ version of the Maya day count in books and online followed by writing this report. The rest of the day will likely be uneventful. Today was a long day, but short on activity. Upon waking Greg discovered, to his dismay, that it was not the frijoles that were keeping him regular, but a bit of vengaza Montezuma – Montezuma’s revenge. He barely even drank his coffee! We discussed plans and decided that I could go without him if Wilma was going, to translate. We in this case meant her and Kukumatz. Alas, Tata was still ill and could not attend. Wilma was very sorry, and so was I, though Greg was happy enough to not miss any helping and be able to Pepto Bismol his way to happiness. Wilma reported that Tata had said that if he is not well by tomorrow, she would take over and we’d go to a different sacred place for her ceremony. I must say that this was not too great a disappointment as Wilma assists Tata in all he does and has a powerful presence herself, a tremendous kindness, and a natural connection with us. Greg worked on getting better while I wrote the report I posted this morning. He was fine by lunch. We ate at a spot across the very busy street from the hotel where a very sullen woman took out orders, which were delicious.